Most hamsters are strictly solitary. If housed together, acute and chronic stress may occur, and they may fight fiercely, sometimes fatally. 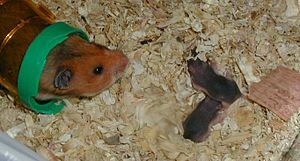 Dwarf hamster species may tolerate conspecifics. 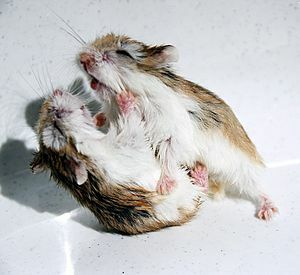 Russian hamsters form close, monogamous bonds with their mates, and if separated, they may become very depressed. This happens especially in males. Males will become inactive, eat more, and even show some behavioral changes similar to some types of depression in humans. This can even cause obesity in the hamster. 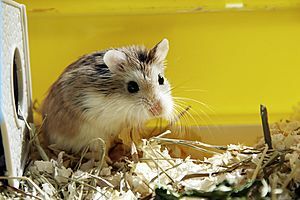 Pet hamsters like to live in cages with wood shavings or recycled newspaper (only if non-toxic). Fluffy bedding is dangerous for hamsters. Plain toilet paper is also a cheap, safe option, but not straw as it is very dry and they may choke on it. 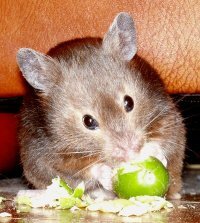 Hamsters eat mostly hamster food sold at a pet shop, but they also eat almost any vegetables and fruits in very tiny portions. 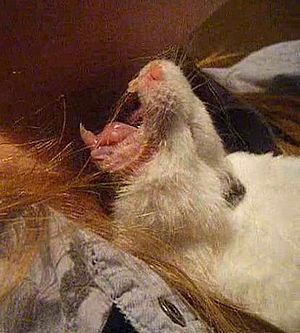 Hamsters store food in the sides of their mouths. Hamster teeth grow constantly. Wooden blocks and some hard food can be used for this. 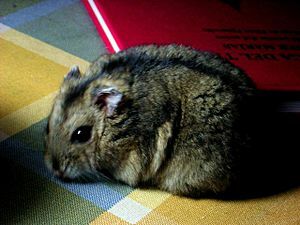 Most hamsters also have a wheel to run on for exercise. A 6 inch (Syrian) wheel is recommended for most dwarf hamsters, and at least an eight inch wheel for Syrians. 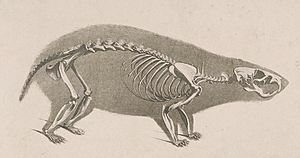 Some people get other kinds of exercise equipment for their hamsters, like an empty ball that the hamster can roll around the floor or a long network of tubes with air holes for it to crawl through. They should live in an aquarium (without water) or cage. When letting your hamster out always keep an eye on it. Hamsters may look slow, but are truly very fast. Keep your hamster away from any electric wires, since they like to chew on them. Hamster are not recommended for young children. Hamster Facts for Kids. Kiddle Encyclopedia.